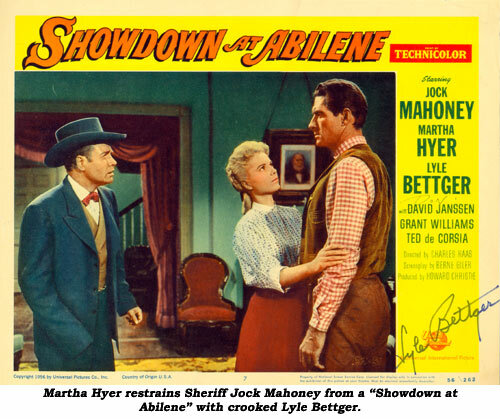 Handsome, blond-haired, steely-eyed western heavy Lyle Bettger was never the stubbly-bearded henchman sort, but always the immaculate, nattily dressed, respectable-in-appearance type who would double-cross you behind your back. Never more evident than in “Destry” opposite Audie Murphy. Born February 13, 1915, in Philadelphia, Pennsylvania, Lyle was the son of St. Louis Cardinals third baseman Franklin Bettger who was born February 15, 1888, in Philadelphia and played ball under the name Franklin Lyle Betcher for 27 games in 1910. In 1935, Lyle left Philly to attend the American Academy of Dramatic Arts in New York City from which he graduated in ‘37. After honing his craft in summer stock and on Broadway for over a decade, he made his film debut in 1950 in “No Man of Her Own” opposite Barbara Stanwyck. Other major roles in “Carnival Story” (‘54) and “All I Desire” (‘53) followed, but Bettger found his true calling as a slick villain in A-westerns and western TVers of the ‘50s and ‘60s. 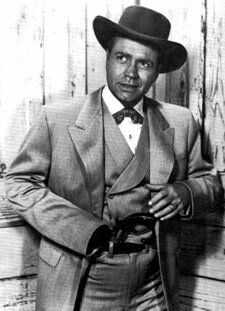 Some of his best roles, besides “Destry”, are in “Denver and Rio Grande” (‘52) with Edmond O’Brien, “Drums Across the River” (‘54) with Audie Murphy, “The Lone Ranger” (‘56) with Clayton Moore, “Showdown at Abilene” (‘56) with Jock Mahoney, “The Rifleman” episode “Skull” (‘62) and “Laramie: Beyond Justice” (‘62). He did pause long enough in ‘57-‘59 to star first in “Court of Last Resort” (NBC) and then co-star with Harold J. Stone, another great screen heavy, in the short-lived syndicated “Grand Jury”. A. C. Lyles continued, “He had a place in Hawaii where he lived a lot of the time and when he retired, lived there all of the time.” This did allow him to work on the “Hawaii Five-O” TV series and accept roles in films such as “The Hawaiians” (‘70) and the TV movie, “M Station: Hawaii” (‘80), his last. 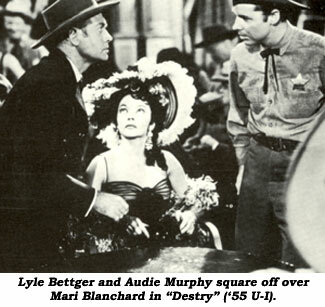 Bettger was married for 56 years to former actress Mary Rolfe who preceded him in death in ‘96. They had two sons, Frank and Lyle R. Bettger. Bettger had lived on Maui, Hawaii, since ‘79, but died at 88 at his son Lyle’s home in Atascadero, California, September 24, 2003.